The clinicopathological observations described earlier, provide the basis for a proposed model of ovarian carcinogenesis, in which there are two main pathways, corresponding to type I and type II tumors. The tumor types, putative precursor lesions and associated molecular genetic alterations are summarized in Table 1. It should be emphasized that the terms, type I and type II, refer to tumorigenic pathways and are not specific histopathological terms. Type I tumors (low-grade serous carcinoma, mucinous carcinoma, endometrioid carcinoma, malignant Brenner tumor, and clear cell carcinoma) develop in a stepwise fashion from well-recognized precursors, namely "borderline" tumors, which in turn, develop from cystadenomas/adenofibromas (Fig. 1; Table 1) (14). The benign tumors appear to develop from the surface epithelium or inclusion cysts in the case of serous and mucinous tumors and from endometriosis or endometri-omas in the case of endometrioid and clear cell tumors. Type I tumors are slow growing as evidenced by the observation that they are large and often confined to the ovary at diagnosis. In contrast, type II tumors are high-grade and usually have spread beyond the ovaries at presentation. 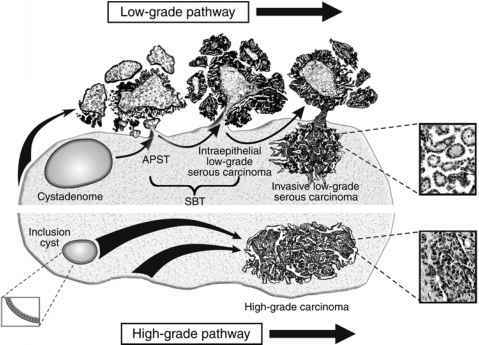 Type II carcinomas include what are currently classified as high-grade serous carcinoma ("moderately" and "poorly" differentiated), malignant mixed mesodermal tumors (carcinosarcomas), and undifferentiated carcinoma (Fig. 1; Table 1). Once believed to be mixed tumors consisting of carcinoma and sarcoma, malignant mixed mesodermal tumors (carcinosarcomas) have been shown to be monoclonal (15,16) and accordingly, these tumors are currently considered high-grade carcinomas with a metaplastic sarcomatous component. Type II carcinomas evolve rapidly, disseminate early in their course and are highly aggressive. As these tumors are rarely associated with morphologically recognizable precursor lesions; it has been proposed that they develop "de novo" from the surface epithelium or inclusion cysts of the ovary (17). It is likely that conventional high-grade serous carcinoma does not develop "de novo," but from precursor lesions termed "dysplasia" by some in inclusion cysts that undergo rapid transition from a microscopic carcinoma to a clinically diagnosed carcinoma. Although, it is believed that the proposed model accounts for the development of most ovarian carcinomas, it is likely that other pathways of tumorigenesis exist. For example, it is not clear whether some low-grade serous carcinomas (type I) progress to high-grade serous carcinomas and whether there are other subsets of type II carcinomas. Molecular profiling and epidemiological studies will be important to determine whether there are distinct subsets of type II tumors.